Using its robotic arm, the InSight lander gingerly placed a hexagonal device onto the smooth Martian surface on Wednesday. It marks the first time in history that a seismometer has ever been placed on Mars—or the surface of another planet for that matter. 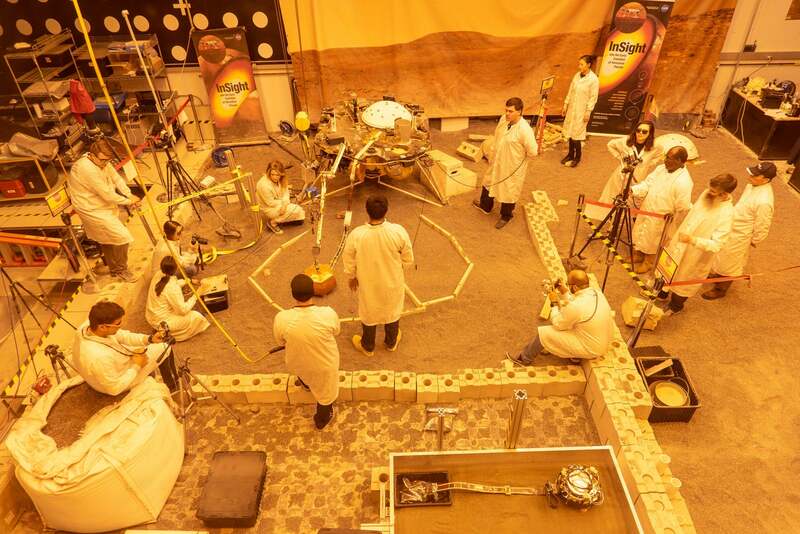 InSight landed on Mars on 26 November, and it’s now getting down to the serious business. After checking out its new workspace and taking a cool selfie, InSight will now set up the Seismic Experiment for Interior Structure, or SEIS—an instrument deemed critically important to the mission. In preparation for the SEIS deployment, mission planners made sure the probe’s robotic arm was functioning properly, and that a suitable spot on the surface was chosen. And because practice makes perfect, team members went through the deployment procedure using a replica in a test bed at NASA’s Jet Propulsion Laboratory in Pasadena, California. When the time finally came for the real deal, InSight gently placed the seismometer on the surface directly in front of it, as far away as possible—about 5.4 feet or 1.6 metres away. This particular spot was chosen to keep the device as far as possible from InSight’s feet; it allows the device’s cable to rest on the ground and provides even contact with the surface. It also leaves space for the heat probe to be placed later. The copper-coloured device is now sitting pretty on the Martian surface, but the deployment is still incomplete. SEIS needs to be levelled, as it’s currently tilted on the ground at a very slight angle of 2 to 3 degrees. Over the next several weeks, NASA scientists will carefully analyse data extracted by the device to test the reliability and integrity of the information being sent back to Earth. The InSight team might have to adjust SEIS’ wire-lined tether to minimise any noise travelling along it, for example. For the final stage of the setup process, InSight’s robotic arm will place the Wind and Thermal Shield over the seismometer to stabilise the environment around its sensors. Once SEIS is up and running, it will listen for marsquakes—the so-called “heartbeat” of the Red Planet. The device should be able to detect seismic waves passing through the layers down below. Planetary scientists have previously shown that plate tectonics exists on Mars, though not nearly on the scale as what we see here on Earth; major tectonic shifts occur about once every million years on Mars. That said, SEIS should be able to detect tiny seismic ripples. Scientist will use this data to learn about the depth and composition of these layers.